Do you feel the stresses of everyday living bringing tension to your body? Can you let your senses bring you into a state of profound relaxation? Would you like to experience a simple but deep relaxation for your body and mind? Come along and explore full body relaxation with the sounds and sensations of Nepalese singing bowls. The clear and simple tones of a singing bowl ring out when it is struck gently, and with the singing bowl resting on your body its sounds are set in motion when struck with a soft mallet. You can experience the sound travelling through your body with gentle tones and soft, wave-like vibrations. If a bowl is placed on your right foot you could feel a soft vibration travelling through your tissues up your leg and that motion can travel across to your left shoulder or even into your head. You might feel as if the vibrations are creating space and opening you out from the inside. What happens in a sound massage? In Peter Hess® Sound Massage we take you from silence into sound, from sound into silence. All you have to do is to lie fully-clothed on a soft couch. You can even have a sound massage sitting down if you are not able to lie on a couch. You follow the sounds through your senses. …and you can feel a slow winding down to stillness, bringing harmony back to your body. I use singing bowls that have been hand-beaten according to the tradition of the ancient, bowl-making crafts of Nepal. These bowls have been made under the guidance of old craftsmen and of Peter Hess, who created the concept of using singing bowls on the body to bring harmony and contribute to full body health. 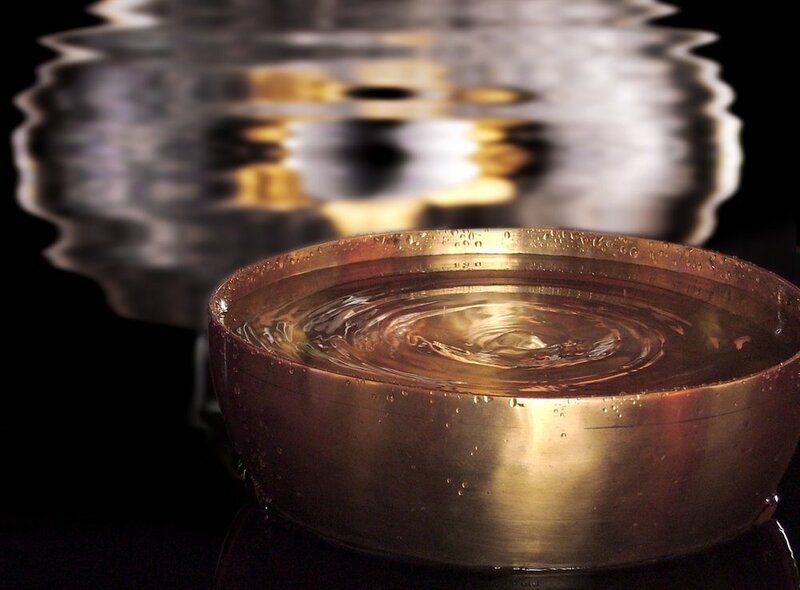 The singing bowls are made from different metals, and each one contains between 5 and 12 metals. The combination of metals determines the quality of vibration and the sound of the bowl. For Peter Hess® Sound Massage, bowls of different sizes have been crafted to resonate well with different parts of the body. The larger singing bowl creates deeper sounds and is suited for the upper and lower abdomen. A medium singing bowl with a wide sound spectrum resonates best with joints, hands and feet. The smallest bowl with the higher tones is suited for the head. How is sound massage used? Peter Hess® Sound Massage Therapy is well-established in Germany where it is used in hospitals with patients in intensive care; in clinics and care homes for patients with dementia; in schools and kindergartens for focus and relaxation with children; in complementary therapy clinics for relaxation and maintaining well-being; and in yoga where gongs and singing bowls support relaxation and meditative states. I trained in sound massage with Peter and Emily Hess in Schweringen, Germany and I am really happy to be able to practise this gentle relaxation therapy.